More than 90 per cent of HCM City’s CO2 emissions in 2013 came from transportation and stationary energy, which refers to fuel consumption for electricity generation, manufacturing, construction and others like domestic heating. 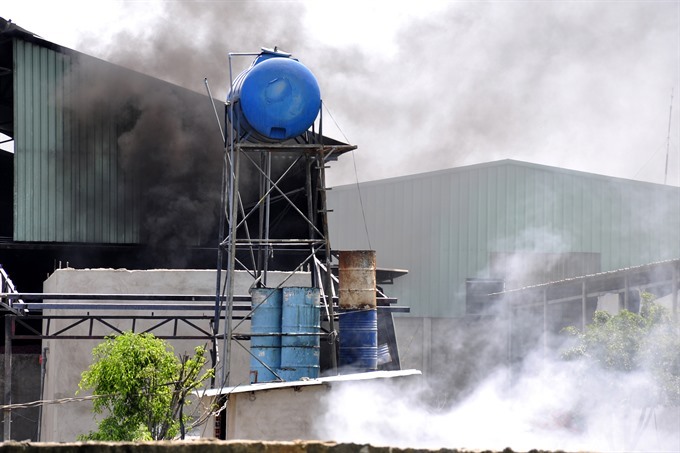 Air pollution caused by a plastic bag recycling factory in Dong Nai Province. Transportation accounted for 45 per cent of the emissions, mainly from vehicle exhaust. The figures were released at a workshop to review the outcomes of the HCM City component of a project to “Support the Planning and Implementation of Nationally Appropriate Mitigation Actions” (SPI-NAMA) initiated by the Japan International Cooperation Agency (JICA) on Thursday. JICA collaborated with the city to enable a proper understanding and continuous monitoring of greenhouse gas (GHG) emissions in the city and completed its GHG inventory for 2013. According to a JICA report, Viet Nam’s CO2 emissions in 2010 and HCM City’s in 2013 were 246.8 million tonnes and 38.5 million tonnes respectively. Their corresponding populations were 87.1 million and 7.8 million, meaning HCM City was responsible for 16 per cent of the country’s CO2 emissions despite having only 9 per cent of its population. The report also shows that compared with other city members of C40, a network of the world’s megacities committed to addressing climate change, HCM City’s emissions per capita were 4.2 tonnes, or similar to Seoul (4.6 tonnes), London (4.7 tonnes), and Buenos Aires (4.4 tonnes) though it trailed far behind them in terms of per capita GDP. For computing a city’s emissions, the GHG emitted to produce power elsewhere for its use, are taken into account. These findings are essential for HCM City to find ways to cut its emissions to help the country meet its GHG emission targets, experts have said. The technical co-operation project aims to enhance the capacity of the Vietnamese Government in planning and implementing NAMAs. It included two components: one at the national level to enhance the capacity of the Ministry of Natural Resources and Environment to facilitate the development and implementation of NAMAs, and the other at the local level to enhance the capacity of HCM City to quantify GHG emissions and reductions. Kakioka Naoki, a senior representative from JICA, said all the expected outputs have been achieved from the project. “The manuals for MRV [Measurement, Reporting and Verification] and GHG inventory at the city level have been developed successfully. Nguyễn Văn Tuệ, director general of the ministry’s climate change department, hailed the outcomes of the project and expressed the hope that the ministry would soon adopt the two manuals as a practical reference for the implementation of a Government decree on a roadmap for reducing GHG emissions.